For over 70 years, Gray Line Alaska has been helping travelers explore Alaska and the Yukon. We offer an extensive array of Alaska tour packages from multi-day and escorted itineraries to Denali rail tours and sightseeing trips. Gray Line has the knowledge, expertise, and infrastructure for one-stop shopping to create a memorable Alaska vacation. Gray Line Alaska is a division of Holland America and Princess Cruises. These 2- to 5-day tours are available roundtrip or one-way from Anchorage, Fairbanks or Seward. Travel via deluxe motor coach and/or luxurious railcars on the Alaska Railroad and overnight in Denali, the Talkeetna area or both. Pre- and post-night hotel stays in Anchorage and Fairbanks are optional. 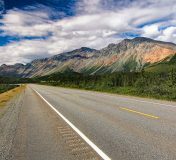 Our most popular Alaska tour packages focus on the Denali corridor with 6- and 7-day itineraries. Along with Denali National Park, Explorer Tours may visit the Kenai Peninsula, Prince William Sound, the Talkeetna area, and more! Our self-drive tours are a great choice for travelers who enjoy going at their own pace but don't want to make all the travel arrangements. Hop in a vehicle and hit the open road. Experience a truly personalized Alaska adventure. If you prefer the camaraderie of a group, Gray Line offers several escorted itineraries. Enjoy the convenience of an accompanying tour guide to handle logistics and provide information while traveling in a glass-domed railcar, boat and deluxe motor coach, with many meals included. 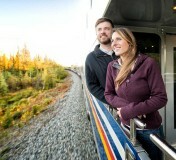 Gray Line offers sightseeing and day tours in both Anchorage and Fairbanks. Tour options include city tours, Alaska Native culture, a riverboat cruise, gold panning and a glacier cruise to Portage Glacier on the mv Ptarmigan. 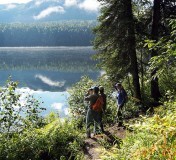 Customize an Alaska tour package for your group of 15 people or more. 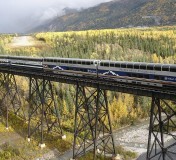 Add a trip to Denali following your cruise or take an extensive tour of the Interior of Alaska. We can customize trips with sightseeing tours, transportation and lodging, and tailor itineraries to fit your group's needs and preferences.